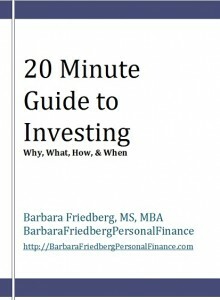 The 20 Minute Guide to Investing is HERE! 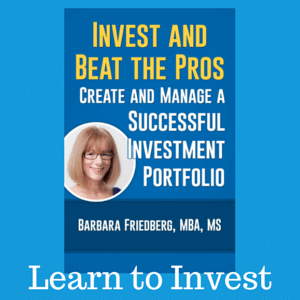 If you have any interest in learning about investing, either now or later, you must download the free eBook, The 20 Minute Guide to Investing ! Why am I offering it for FREE? I am passionate about investing and financial literacy. Even if you don’t have the funds to invest now, I’m hoping that you will in the future. This guide will arm you with investing basics and is a great place to start learning. 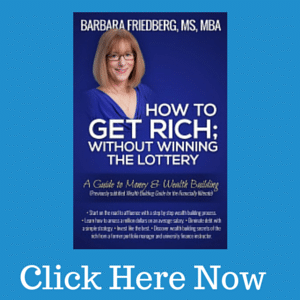 I want BarbaraFriedbergPersonalFinance to be your go to resource for personal finance information, motivation, and solutions. There are hundreds investing books around, why bother reading this one? 3. It’s written by someone who has worked in the investment field, studied investing, & has the academic degrees to back it up. 4. It covers the basics without the extras. 5. It’s easy to understand. 6. It makes investing clear cut and easy to implement. If the past is any indication of the future, investing offers the opportunity to earn greater returns than leaving your money in the bank. Historically stocks have returned about 9% per year over the long term and bonds have earned about 5% per year. That’s quite a bit better than the lower returns from a bank savings account. Sign up on the form Wealth Tips Newsletter form above or just click on the link; 20 Minute Guide to Investing. Follow the instructions in the confirmation email. 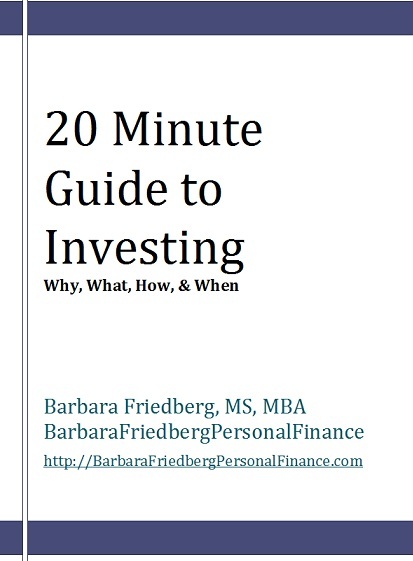 The 20 Minute Guide to Investing will be in your Inbox before you know it. Now, tell your friends, and tweet this post. Let me know what you think of the book? Any questions? I will be reading it more in depth, hopefully sometime soon, and will post a mini-review on my site when that’s done. 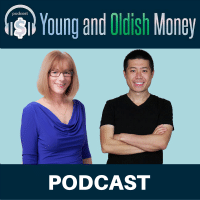 @Invest it Wisely-Thanks for the quick feed back. Looking forward to the mini-review. Enjoy! Suba, I look forward to your comments and thank you for the future props! Enjoy the book! That’s quite a valuable free resource. An all-around good read for encouraging someone to start investing. I’ll be including this post in my links this weekend. Have a nice day! @Dividend- Thank you for the comment, download and link love. Enjoy! Hey Barb – I have downloaded it, can’t wait to read it!